Eldoret, Kenya, December 2015. Length is about 5 mm. This is a male as evidenced by the plume-like antennae. The immature stage of Chironomid Flies, also known as Non-Miting Midges, resembe small work-like creatures and can be found in the mud and detritus at the bottom of ponds and streams. Many are red in color and are called bloodworms. 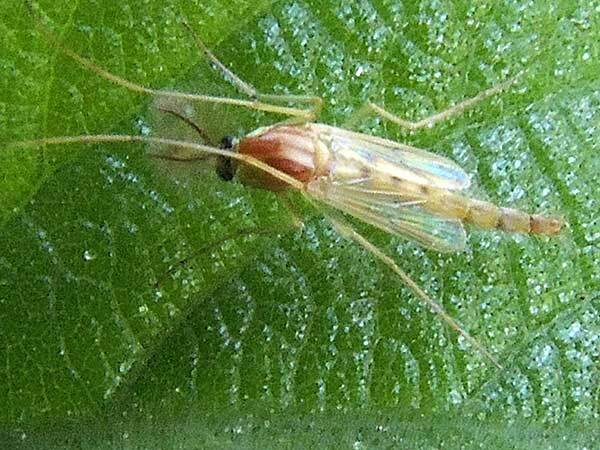 The adult midges look like mosquitoes, but unlike mosquitoes they do not bite. The wings of chironomids are clear whereas the wings of mosquitoes have dark scales visible as a grey pattern. Chironomidae are vital components of fresh water ecosystems breaking down organic matter and contributing to the food chain as prey for fish and other animals.